The Trans-Texas Corridors are supposed to ease congestion on the state�s highways, but opponents call it a money grab. When the state transportation department held a public meeting in February to talk about a new highway project, local residents milled around amid the state employees and consultants, watching a videotape that played over and over, looking at the maps, picking up printed information. It was a quiet meeting � not unusual, since most transportation projects receive little attention until concrete starts getting poured. But this isn�t your average stretch of concrete. 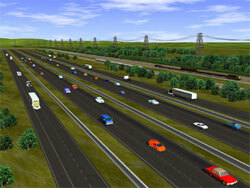 This is the biggest highway project you�ve never heard of � coming soon to cover a piece of countryside near you. The Trans-Texas Corridors are a huge and hugely expensive project that could reshape Texas transportation and commerce for the foreseeable future. The corridors are envisioned as a 4,000-mile network of highways, railways, and utility lines criss-crossing the state roughly parallel to the interstate system. Each corridor could have a right-of-way of up to 1,200 feet � that�s six lanes of light traffic, four of truck traffic and three rail lines, one each for conventional freight, high-speed freight, and high-speed passenger rail � almost all of it to be located in what are now rural areas. Construction costs for the entire state-wide system are estimated at $183 billion � almost half the cost of the entire U.S. interstate system in 2004 dollars. Most remarkable is the project�s new approach to highway finance: The private sector expects to pour millions of dollars into this public work, in return for a profit. The $6 billion first leg of the corridors, TTC-35, will be built and paid for by a consortium led by Spain-based Cintra, which will have the authority to set tolls along the route. For 50 years, all toll revenues will go to Cintra. What do Texas residents get out of the deal? A faster trip to San Antonio, with speeds up to 85 mph and no congestion, at a cost of up to $50. They might get less traffic on I-35. They definitely will get swaths of concrete replacing farm land and air pollution where there wasn�t any before. If one of the western options is selected for the northern section of TTC-35, Fort Worth could get a new super-highway heading southwest from I-35 north of Denton, cutting across a corner of Wise County, turning south between Azle and Weatherford and swinging southeast west of Cleburne. What does the state get out of it? A free road, for one thing. For another, $1.2 billion in fees from Cintra. It�s a good deal for the state, said Ric Williamson, who chairs the Texas Transportation Commission, the governing body of the Texas Department of Transportation (TxDOT). It�s a state of mind with a headache � and a fascinating list of opponents. The Lone Star Chapter of the Sierra Club called the Trans-Texas Corridors �road design with a meat cleaver.� The Texas Farm Bureau denounced the plan as unfair to rural Texans. The Texas Republican Party opposed it in their 2004 party platform, citing state sovereignty. The list of supporters, however, is headed by one Gov. Rick Perry. No one disagrees that Texas has a congestion problem � but there�s plenty of disagreement over what to do about it. �You cannot plan a trip from Dallas to San Antonio because you don�t know how long it�s going to take,� said TxDOT spokesperson Gaby Garcia. �In the next 50 years, we�re looking at that traffic to grow considerably.� NAFTA dramatically increased freight traffic in the state, increasing congestion on I-35 � as most Fort Worth drivers are all too aware. 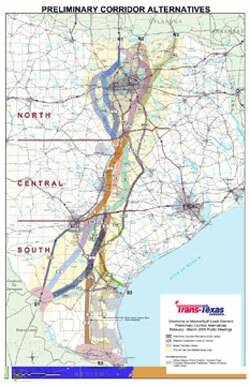 The Trans-Texas Corridors, Garcia said, are designed to efficiently move drivers across Texas. The corridors will bypass congested urban cores, taking wide loops around cities. The idea is that a trucker heading from Oklahoma City to San Antonio doesn�t need to drive through Dallas and Austin. By getting this through traffic out of cities, the theory goes, urban congestion will decrease. But urban congestion isn�t caused mostly by pass-through traffic, it�s generated locally, so the corridors won�t help cities at all, said David Stall, co-founder of CorridorWatch, a nonprofit organization opposing the Trans-Texas plan. Meanwhile, 10 lanes of auto traffic would be vast overkill for rural sections between cities. �There�s not a demonstrated traffic need. They can�t point to a single traffic study that says it�s required,� Stall said. The routes of the corridors are also generating heat, with attention focused on the first leg, TTC-35, which will parallel I-35 from Oklahoma to Mexico (the exact route has yet to be selected). The second corridor, TTC-69, will swing southwest from Texarkana to Houston to the Mexico border at either Laredo, Brownsville or McAllen. The other two priority corridors are TTC-45 from DFW to Houston and TTC-10 from El Paso to Houston. The state plans to locate the corridors in rural areas rather than buying costly urban land or expanding existing interstate routes through city centers. But cities along I-35 say a competing route would hurt them. Dallas worries about maintaining easy access for truck traffic to its warehouses and distribution centers. Hillsboro fears that if I-35 traffic leaves for the TTC-35, the business and restaurant boom it has built around its major outlet mall will be killed off. Meanwhile, the Texas Farm Bureau says it�s unfair to put the land burden on rural Texans. Its members fear their properties will be bisected by quarter-mile-wide stretches of concrete. And the Sierra Club worries about the division of habitats, since most animals can�t cross wide freeways, and fears increased pollution in once-clean rural areas. �You�re going to have air pollution. Water pollution. Rubber from tires, asbestos from brakes, and oil products from cars,� said Kallerman. The most untested aspect of the Trans-Texas Corridors is the financing strategy. Private investors will pay to design, construct, and operate the freeways, making their money back in tolls. This model has been used in Europe and Asia but never before in the United States. A new approach is needed, highway officials say, because the gas tax brings in enough to build only one-third of the state�s needed highway projects each year and Perry has vowed to veto any attempt to raise the tax from the 20-cents-per-gallon rate fixed in 1991. And, an investor putting in all of the money upfront means each corridor can be built all at once, rather than piecemeal, as projects are now done. �Our view is that big public works projects should be financed through the risk-taking of the private sector and paid for by the user freely choosing to take them or not,� Williamson said. Whether enough users will choose the road to make it profitable is a question that TxDOT can�t answer, because the state claims it has conducted no studies to estimate the volume of traffic on the corridors. Why Cintra is willing to invest so much money on an unstudied proposition is also unexplained. Free-market advocates like it. �The more that we can leverage private dollars, the better off the taxpayer is,� said Michael Sullivan, vice president of the Texas Public Policy Foundation, a conservative think tank. Opponents seem to lack the political muscle to halt the project. On March 11, Rep. Garnet Coleman, a Houston Democrat, filed a bill to place a two-year moratorium on development of the corridor plan. Observers, however, give the measure has little chance of succeeding. It will be considered by the transportation committee � chaired by State Rep. Mike Krusee, a Williamson County Republican, who sponsored the original corridor legislation in 2003. Elizabeth Lunday is a Fort Worth freelance writer.